Anne Shirley was not the first bright, bubbly, garrulous person to shake up Marilla Cuthbert. An aunt arrives to stay awhile at the Cuthbert place, Green Gables, exhibiting louder and more voracious habits of living life than young Marilla (and Matthew) are used to, which they can "barely tolerate"... and thus is Marilla Cuthbert's fictionally-imagined life at 13 years of age. The novel continues uncovering more years of Marilla's hidden past for us... A literary character we already know and love from the Anne of Green Gables series, now reimagined, reinterpreted, reborn. "Silence had always been a Cuthbert comfort." I started noticing clues right away from Montgomery's Anne books... Elements that made me feel right at home. Yep, there's the family recipe of red currant wine. Yep, there's all the same neighbors and recognizable family names. Yep, there's the Matthew I know, a boy who barely speaks a word, who turns into a man of wise caliber. Yep, there's the brooch. It's all in there, people. The story before the story. It's such a unique experience to see, touch, and hear Green Gables before Anne arrives. The only thing we ever knew of this fantastic place was to take it in all-new when Anne arrives for the first time. Now we see it in its innocent infancy, through the eyes of a girl who is already accustomed to its beauty, who sees it for what it is... but who will inevitably, continually discover its secrets for decades of her life. There's a lot of things in Avonlea that still feel exactly the same, just a few decades apart from the original story I cherish. For example, I might have squealed with delight when 13-year-old Marilla's meets a new friend. One of the infamous name Rachel... Now there's a friendship for the ages. This book does open the reader's eyes. Stern-faced Marilla was a young slip of a girl once, with childish notions in her head. One sentence surprised me the most though... It mentions that when she was a little younger, she believed fairies lived in a particular tree hollow she liked. Fairies? Marilla? Well, maybe so. She was young once too, just like red-headed Anne. "Tears were misunderstood, she thought, and used inappropriately most often. They were designed as a private response of being. Because sometimes life filled you to the brim and spilled over." Something the author did differently is that she brought in pieces of historical interest, lining up events in Canada's political history of that time period. Having this in the story definitely sets it apart from Montgomery's writings... This additional historical context is the only thing that made me stop and wonder if I liked it in the story or not, as it seems a bit out of place, especially after I'd just been reading a sweet, charming Montgomery original, which isn't fettered down with such. I can accept it though, for the sake of the rest of the novel. Note to parents and the discerning reader: Overall, it's "fairly" clean. But there is a rather passionate, dramatic kiss when Marilla is about 15. Also, there are various conversations about pregnancy and child-birth. I might recommend it for ages 13 and up, but only if your kid is ready for those topics. Plenty of faith-based elements are woven all throughout the chapters, which I personally am glad to see. Overall? 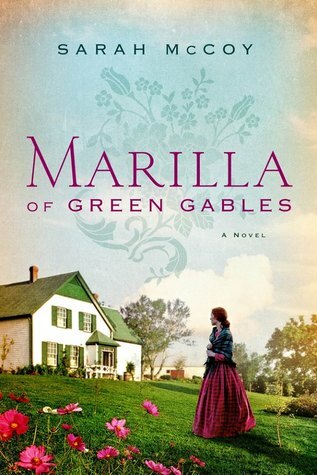 Marilla of Green Gables is an enjoyable read and a beautiful experience. I do feel like the author has done justice to the original and stayed as pretty close to the truth as we know it. It's filled with nostalgia. Honestly, I want this new book to be turned into a movie. But you know what I want even more than that, Sarah McCoy? Please write us Matthew's story too. We do get to see some unique sides of Matthew here in Marilla's story... but I do believe there's still more to discover about that remarkable man. "He that hath knowledge spareth his words -- that was from the Proverbs, and underlined by Hugh in their family Bible." Yes, I want all of my fellow Anne friends to try this book out... and I sincerely hope you'll like it! If you don't, then I like to hear your reasons why. Let's discuss it, kindred spirit. P.S. Like and vote for this review on Goodreads. I just finished this one yesterday and hope to review it soon. I was wary at first, but I thought it was faithful to what we know of the Marilla of GG except for the couple of areas you mentioned. I wasn't sure if I liked the political aspect, either. And I felt the kiss was written with a totally wrong tone for this kind of book. Yes, Marilla would have normal feelings and such, but for most, especially in that time, a first kiss would have been sweet and chaste. But otherwise I really liked the book.